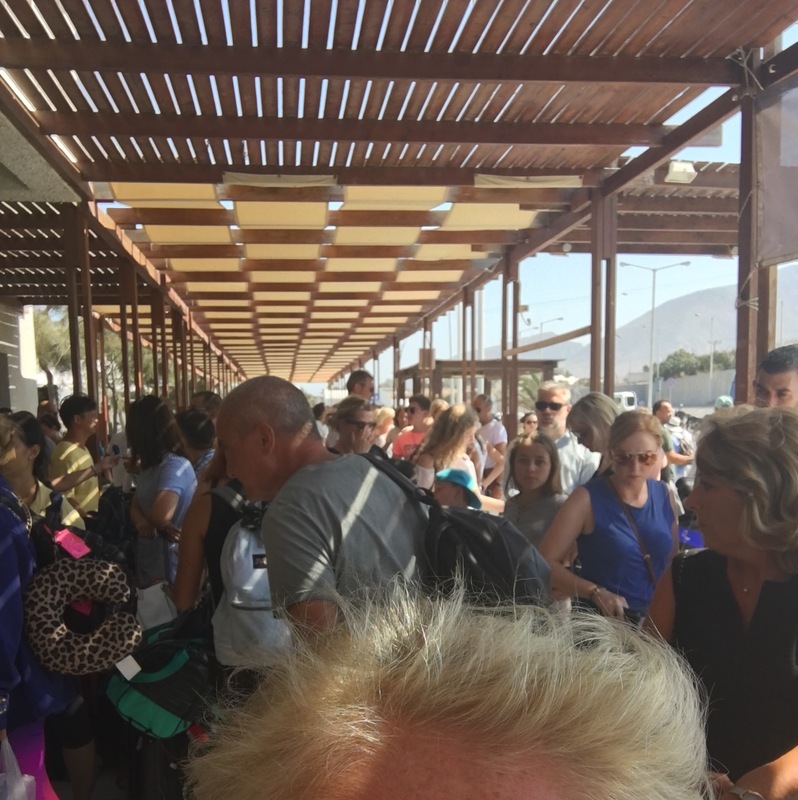 It's ironic that Santorini, a beacon of opulence and luxury, has the most sub-standard airport I've ever been to. 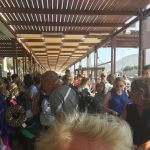 The staff were rude, facilities disgusting (the toilets were worse than a campsite and stunk out the airport), and organisation bad even for greek standards. 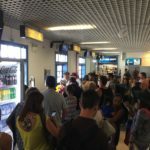 We were forced to wait in line for security (which locals just jumped over and walked through), for 40 minutes because the airport was 'full' - they had however failed to open any of the waiting areas. What transpired was a large group of people crammed into a tiny area, with the smell of sewerage lingering through. Not a great way to end your trip. Arrived on Ryanair from Athens on a day trip, we only had hand baggage. We picked up a rental car and were away within 15 minutes. Returned to Athens in the evening on Aegean. Small airport only opens for a couple of hours prior to flight departures. Checked in on line so no problems .Security was very poor, airport staff including the lady from the cafe wondered landside to airside with no scans or checks of any kind. Toilets very poor, broken locks, no lights in one, the only one to be acceptable in departures was the ladies. I would not like to use this airport on a busy, hot summers day. The arrival went reasonably well. The departure was atrocious. The other reviewers really aren't wrong - it was absolute chaos. We were queing outside in long queues for about 30 mins, then let in by our Thomson rep 6 at a time, another queue to have your luggage weighed whilst people are crammed in and pushing past you, then yet another queue to hand your luggage in to be x-rayed (thank goodness for the Thomson rep who was loading everyone's cases for them due to lack of airport staff). Then finally crammed into the passport/boarding area like sardines. No one knew what was happening. One person checking about 400 peoples passport's. If it wasn't for the Thomsons rep callling out for boarding - we would still be there crammed in. This spoilt a beautiful holiday to a lovely island. "destroys the enjoyment of the holiday"
Absolute chaos. Long, long queues. 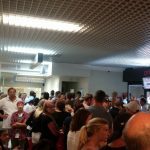 Aegean Airlines broke into a queue that had been waiting for more than 30 minutes to ensure their passengers shortcut the wait even though the queueing passengers flights left earlier. Beautiful island but the chaos of the airport destroys the enjoyment of the holiday. Don't expect much here. It is tiny with very limited services. I had read horrific reviews so didn't get there too early. Don't. It depends how many flights are taking off when you check-in. Aegean flight's were queueing outside. None for mine. 3kgs overweight no problem. You then take case to put through scanner. A couple of shops and duty free downstairs. Limited room or seating. Go upstairs to cafe bar with outside seated terrace, watch your plane land, empty out, then head for departures. All bussed 2 mins away. Small airport with not many shops. The staff were unprofessional. A lot of delays for such a crowded airport. One person was trying to clean the departure area. Have experienced small airports, none compare to this one. We arrived at the airport almost 3 hours prior to our scheduled flight time with Thomas Cook. 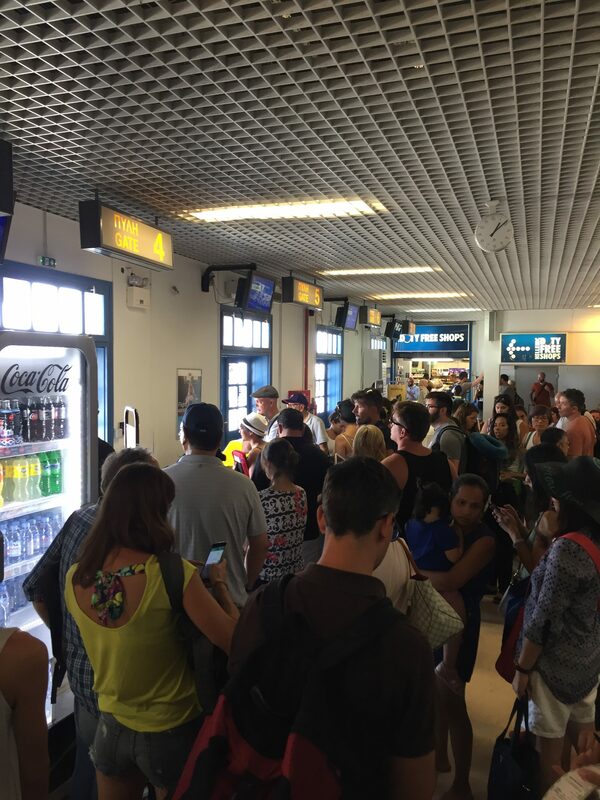 There were already two very long queues outside for our flight and a Thomson flight. We were coralled round an area outside which was only partly shaded from the scorching sun so a very uncomfortable wait. Queue finally started to move after around 40 mins but took another 30 mins just to get to the airport door. Check in was painfully slow even though there were at least five check in desks operating. Once checked in we joined another queue to pass the cases through the x-ray machine, this took around another 15 mins. The worst was yet to come when we then had to join yet another queue for security. This snaked outside the airport and was about five to six people deep in places! We shuffled along in this queue for almost an hour, two security staff operating one belt and scanner, where totally unconcerned about any alarms that were being activated as passengers struggled through. Beyond this was passport control and boarding gates which we couldn't get near because of the sheer volume of people. After standing for another 30 mins jammed in like sardines we became aware if another female passenger shouting that passengers for the Thomas Cook flight needed to board immediately! At no point were there any announcements from airport staff, in fact we couldn't see any staff anywhere! 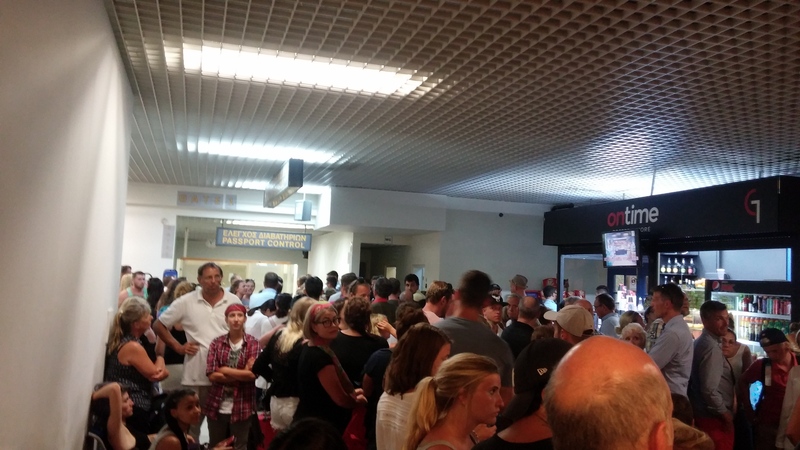 We had to push our way through the football crowd to get to the boarding gates, never even saw passport control! The airport is woefully inadequate to deal with the amount of passengers departing and dangerously understaffed, security is non-existent. As a final insult we were then delayed an hour after boarding as the ground staff had made a mistake in counting the cases being loaded on to the plane! Santorini is an amazing island and this was such a sad and dissapointing way to leave it! Passenger safety at tis airport needs to be addressed as a matter of urgency. We have never visited such a chaotic airport. We had to queue up outside and wait to be called to check in, then put our luggage onto a belt to be x-rayed, doubt if the person in charge was even looking at the screen. Because the departure area is so small our tour operator advised us to sit in one of the cafes and wait to be called for our flight. Next came the security check, once again chaos. When my husband went through the arch the bleepers went off (always happens, he as had both knees replaced) nobody bothered to frisk him or anybody else who had the bleepers go off, the staff where to busy talking. All this happened a few days after the Tunisia incident when we expected security to be very tight. Next the holding area where the exit gate to the plane was, well not big enough, packed in like sardines. I can tolerate small airports but the Duty Free shop sold us alcohol in an unsealed bag. We didn't give it a thought until arriving in Athens to transfer to an international flight and the customs people said we couldn't take it through even though the bottles themselves were unopened we had the receipt and had only bought it an hour earlier! Not customs fault they were following the rules and were very sympathetic. Luckily we had time to go back through passport control (much to the ire of the officials) re-pack our carry-ons and check one of them containing the alcohol in as checked luggage. Very poor. The Duty Free Shops should know the rules and abide by them. Horrible customer service. No wifi. Employees seemed to have no idea what was going on. Terrible last impression of a lovely island.